I chose to hack the MACKAPÄR into an earring holder because I have a very large earring collection. I wanted something minimalist and removable. The cost was under $20. Use the shoe plates in the MACKAPÄR, legs are not necessary. I mounted them horizontally and used the small holes on the side. Ensure the L hooks fit the small holes on the side (see picture). If they do not, enlarge with the drill. I mounted mine to drywall so wall plugs were required. Drill holes in the wall, knock in the wall plugs and screw in the L hooks. The hardest part was matching the hook length and strength with the hole size. Similar hooks could work well. And if it being removable is not important, then the earring holder could be screwed directly to the wall. I mounted a Grundtal Paper Towel Rack on the wall in my closet to hang my earrings on for easy access. It also holds a clutch handbag or two. See the earring and purse rack. Nina used the RIBBA frame and hinges to create a one-of-a-kind earring case. I wanted something fancy to store my tons of earrings, and it would have to fit into my old fashion de viennese pseudo baroque room. I thought the Ung Drill was just perfect for this purpose. See more of the earring picture frame. Having lots of hook earrings I was looking for somewhere to hang then cause they always get tangled into each other. I had seen the mesh system stapled into a picture frame but I didn’t feel like crafting. A quick scan on my office and I found the perfect solution. See the quick and easy earring organizer. This hack is great for someone like me who loves to own a lot of earrings and need something to display them out neatly without costing too much. The TOLSBY is an excellent choice for earring display at home and for product selling, I have used this display for my local craft fairs to great effect. 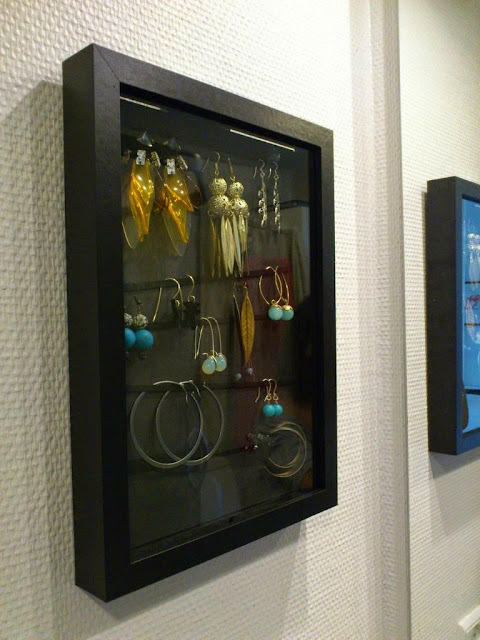 See the TOLSBY earring display. Next ArticleHackers Help: Fix broken Spar on MALM Chest?